Inspired by Ballard Designs again! I mentioned then I had a Ballard project in mind for above this table to replace the art I had on the wall. I saw these in the catalog the day before I finished up that table and knew they MUST BE MINE: I knew as soon as I saw them they would be perfect for that wall, and I also knew they would be easy and cheap to do on my own. I like easy and cheap. I've had the materials for this project for ohhh...ummm...a MONTH, maybe more? And then I saw Traci had done them as well and that was the inspiration I needed to get my booty movin'. My table is only two feet wide, so I wanted them to be a bit smaller and got them cut at 19" long. The piece of wood was less than $4. I started measuring and cutting the trim to figure out the cuts: At first I was using my miter box, and then remembered I AM WOMAN and went right for the compound miter saw instead. Either way works! The next step was to yell a bit, (maybe) cuss a little, and stomp my feet because I measured wrong and ended up running out of my trim. Instead of another trip to Lowe's (it was nap time so I was stuck anyway), I used some trim I had already purchased for another project. I got my corbels from Home Depot -- they have a much better selection than Lowe's. I got my corbels for the kitchen island from there too. I popped in a few nails to secure them while the glue set, but again, this is not necessary. The lamp cord is (mostly) covered. I can breathe. We don't have a ton of surfaces for accessories -- I mean, I have plenty, but I always wanted something else to spruce up, especially during the holidays. These will be so fun to experiment with! Because I got the big and chunky corbels ($9 each) the whole project was about $48. 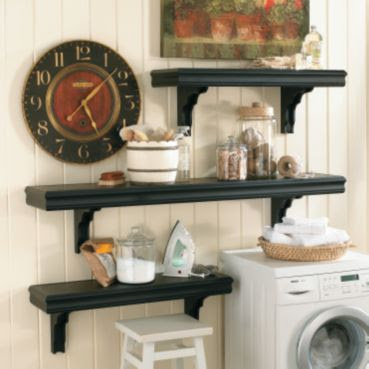 If you use smaller corbels, you could get this done for less than $40 easy. Oh yeah, did I mention Ballard's version is $80 for ONE of the smallest shelves? Ummmmkay. Accessorizing is something I struggle with -- it takes me awhile to get the tchotchkes how I want them. Later this weekend I'll show you the process I went through with these shelves and a few tricks I've learned along the way. Update! Traci gave a great tutorial here! And Jen did one here too!! FAB! I love seeing all these miter boxes out there!! they turned out sooooo amazing what a fantastic set up!! And, oh! You could hide the lamp cord even more if you run it to the right and secure it behind the table (with something like this: http://www.containerstore.com/browse/Product.jhtml?searchId=22636971&itemIndex=4&CATID=69020&PRODID=10020291), then have it coming down to the socket from above, rather than running up from the carpet. Your shelves look great! Love your blog! 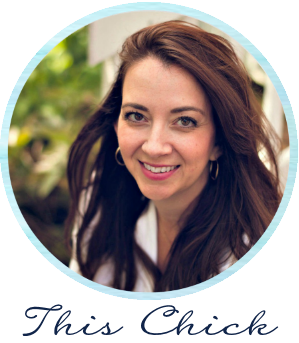 One more thing - just added you to my sidebar -love your blog! I was about to go to bed and saw your post. I was so excited to see that you linked to my blog! How cool is that?! You are a super sweet blogger. Some people wouldn't take the time to do that! Your shelves turned out awesome, but of course, you are a pro at that stuff! I love your chunky corbels, and the trim turned out perfectly! They look great over that table. Thanks for sharing another inspirational post! You are one of the reasons I got the encourage to tackle power tools in the first place. Thank you!!!! Woo hoo! Who "rawks"? You "rawk"!!! Sooo cute! I must copy... Thanks for great instructions! Awesome and I love that you painted them black. Awesome job! Wow! Now I want power tools! can't wait to read your notes on blogging. I'm stuck and love reading yours. have a great weekend. Fab as usual! You never disappoint! And I am even more impressed with your collection of power tools!! Oh yeah, I forgot to add...If you want a chance to win the cafe shelf I made, you can enter my giveaway. incredible!!! Love the power tool tribute :) Go Women! Great project, Sarah, and you saved alot of money! I can't wait for your upcoming post & giveaway. Have a great weekend! Thank you so much for the tutorial! I know it is a bit early, but power tools are definitely on my Christmas list this year! I love this idea for such a small space. I have lot's of those in my house and always wanted to do something with the space. Thanks for the ideas! They really turned out great. Yes, you absolutely rawk! You may have converted this girly girl. I'm going to Home Depot this weekend and I may even ASK for tools this Christmas! They look fantastic, Sarah, and fit that spot so well! I love them. I first saw these over at Rhoda at Southern Hospitality's blog and fell in love with them. Along with about a hundred other things, these are on my list to do! Man, I totally have to get more power tools. And I want a big cute tool belt too! Your shelves look great! Amen to dumpster diving...I always get made fun of for it, but some people are crazy for what they throw away! The shelves look fantastic. Marvelous job! I'm so happy to have found your blog. Those shelves are wonderful. I really like the trim you used. They look better than the ballard ones! The shelves look a-mazing! As usual, I'm completely inspired. I've been completely addicted to your blog for the last 6 months or so and recently decided to jump on the bloggin' bandwagon, so I'm really excited to read your post tomorrow. I was wondering if you could address commenting? I love checking out other blogs and it's nice to leave a little comment but it seems like it's become a game with some bloggers to leave as many comments as possible(even if they're completely insincere) just to drive more traffic to their own blogs. Do you think this is necessary to have a successful blog? Thanks! I bought a few recently and they don't completely solve the problem but they do make cords invisible along baseboard trim! They look great!!! You have no idea how much yours and blogs like yours inspire me. Oh, I love the thick trim! Sarah, I think your house is going to get too beautiful and you are going to run out of projects for your great blog! But I have a solution. I am moving to Texas at the beginning of next year and I think you need to come and spend a week at my house and we can do projects together. We can pretend like we are The Pioneer Woman and Bakerella! I love it! This may just be what I do in my Garage Hallway where I'm working on Fabric Bulletin Boards! Thanks for all the inspiration. I have a nail gun now! Love those, Sarah! You did a great job copying those Ballards shelves. I've got the Ballards originals in my office nook & love them, but they are a little pricey. I was lucky & found them at the outlet store in Atlanta for a discounted price & will love them forever. Maybe you can share this one when you guestpost for me?! That would be cool. Sarah, They look fantastic! Do you use Walmart $1 spray paint to???? Everyone gives me the crazy eye when I buy the cheap stuff. Thats one of my cheap top secret tricks! HA! Love it! You are so inspiring. Can't wait to see what you come up with next. Those are so pretty! I love how you accessorized them too. Those will be fun to change out for the seasons. So gorgeous, girlfriend...and just so you know....SLaHOME is going to discontinue the pottery that matches your pitcher...sale going on right now if you want to take a look. You know my website. Ah! That looks awesome! I love how big and chunky they are! God Bless Ballards. Awesome job and look better than the Ballard ones! The shelves look fabulous! The cord covers mentioned on a previous post are great, but I've been known to take the matching wall/trim paint and paint the cord...hides it instantly! Oh, good for you! These look great! Watch out, Home Depot. You might want to order some new corbels! Adorable! I love the chunky too! Way to go! Did I ever doubt that it'd look fabulous? Nope! :) Love it!!! Sarah, thank you so much for linking to me :) I was excited to see my name on your blog! You are such an amazing person, thank you again! Oh, and I love your trim way more than mine... I am thinking about making a second one and giving mine to my sister :o) is that bad? Love how your shelves turned out! I have a blank wall in my living room and I have been wanting to get 3 shelves to put up but my goodness it's like $40.00 for a 4' shelf. Yikes! I like your idea a lot more. So I think I may have a project to do over the three day holiday if not mostly likely next weekend. I am soooo going to have to get my hubby on this project soon because they are gorgeous! Love the way you decorated them! AWESOME!!!! I love Ballards but yours are even better. I would never even know you had trouble accessorizing. It looks fabulous! Did you say one million hits? Holy moly you go girl!!! I didn't even know that was possible. I can't wait to read all the blogging tips you will give us. Tell us how to increase our hits. Maybe I have a few hundred or so in ten months....HeHe! What???? ~WOW!!!! I just now noticed your iron scroll pieces in your windows. That looks amazing! How did you do that? Please share? This is great, I LOVE IT!!! And I love Ballard Designs. I have enjoyed reading your blog and getting inspiration! You are very talented. If you could just work your way through the Ballard catalog, that would be great! I appreciate you posting the cost too! I was reading it and hoping it would be included!! thanks! That's right baby. Big n' chunky. Just like my thighs. For the cord situation (who cares about the stinkin' economy when I HAVE TO SEE THAT STUPID CORD EVERYTIME I WALK IN THE ROOM??? ), I do the ol' wicker basket on the floor holding magazines or folded up throw blankets (or toys, old expired coupons, leftover containers of Chik-Fil-A BBQ sauce....) and they always seem to be the same height as the outlet. They turned out fantastic Sarah! And you accessorized them beautifully! they look so good. Well Done. Great way to save money! The shelves look awesome! I love the way they turned out...I'm so gonna try and make some too! You are great, love your blog! WOW-these are fantastic! You did such an amazing job. I've got to find a spot where I can use these, I'm dying to make some myself. Thanks so much, I'll be linking. I have been needing a (cheap) set of shelves, this fits the bill! Thanks for the idea and tutorial! Oh my, you never cease to amaze and inspire me! Thanks so much for all your fabulousness and please, keep it coming!!! Fabulous, fabulous! And the accessories look great! oooh sarah i had to tell you! my husbands cute little grandma is sadly but surely getting moved to a home so we went this morning to claim what we wanted from the house- and lo and behold, she had this same exact sewing machine/table. it totally made me think of you. i didn't take it this time around but i got so many fabulous things i'll be up to my elbows in before and afters for the next two years! i'll be excited for you to see! I love these! I would love to know where you found the wood brackets you used. I don't know if I've seen those anywhere around here. Thanks! So love that you made these yourself! I love how you accessorized them too!